Rain fell prior to the game, but that did not deter the Phillies from continuing their winning ways, as they defeated the Nationals 4-2 at Citizens Bank Park on Tuesday night. Phillie batters do not always strike early, but when they do, they can be deadly, as was the case tonight. It was the Nationals who struck first however. 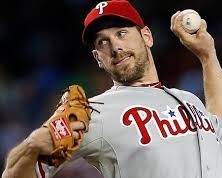 Cliff Lee is known for throwing pitches around the plate. He can sometimes get hurt doing this practice. Tonight was such a case, when ex-Phillie, Jayson Werth, went deep to left for the Nationals in the top of the fourth to give them an early 1-0 lead. The Phillies countered in the bottom of the fourth when Michael Young led off with a double, and was later driven home by Ryan Howard, who is recently starting to drive the ball with more authority, to tie the game at 1. The Phillies were held off the scoreboard in the bottom of the fifth. After Delmon Young was plunked by a pitch, he advanced to second on a ground out, but was thrown out at home when a great throw from Denard Span nailed Young at home plate on a sharp single from Lee. Running on the pitch has always been a great move, and the Phillies executed it to perfection. In the bottom of the sixth, with no outs, Ben Revere, who was moving on a 3-2 pitch, scored from first on M. Young's double into the right field corner. The Phillies piled on two more runs in the inning when, with the bases loaded and two outs, Kevin Frandsen lined a two-run single to left to give the Phillies a 4-1 advantage. The Nationals cut into the Phillies' lead in the top of the eighth, when Jeff Kobernus hit his first Major League home run off Lee to reduce the Phillies to a 4-2 lead. Lee threw a masterful game, tossing eight innings, while surrendering two earned runs and striking out nine. M. Young had a great night at the plate, going 3-4 with three doubles, while tying a career high. The Phillies will try for a three-game sweep of the Nationals tomorrow night, to extend their current winning streak to four. - Samuel Botwinick is a staff writer for the Philadelphia Baseball Review. Contact him at sbotwinick@philadelphiabaseballreview.com or @avdbkr20samuel on Twitter.